The Cambridge Theatre opened in 1930. It was designed by Wimperis, Simpson and Guthrie with an auditorium on three levels and a seating capacity of 1,275. The exterior of the Cambridge is faced mostly with stone, the metal windows, the entrance canopy, and the display signs are painted Cambridge blue. 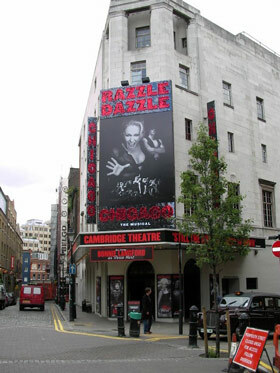 The Theatre is run by Really Useful Theatres and is home to Chicago which transferred from the Adelphi Theatre in early 2006.